Score. 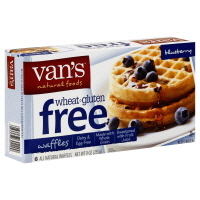 Another great try from a Van’s gluten-free product. The blueberry waffles are absolutely delish. Light, fluffy, and full of flavor. Even if you aren’t on a gluten-free diet and just want to get rid of the bloat caused by all the white starchy processed foods that you are eating, try some of the gluten-free products. I can’t say that I am 100% gluten-free but when I can substitute I will. I have more so much more energy and just all together feel better.